Measuring ride height to find out if a front spoiler works. Anyone can whack on a front spoiler - either as part of a body kit or a more subtle design positioned under the car near the front axle line. But will it work? In this story we test whether some trial design front spoilers actually provided downforce. All the testing was done on the road and some fascinating results were gathered. 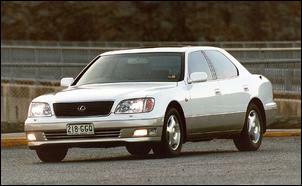 While there are many aspects of my '98 Lexus LS400 that I like, one shortcoming of the car is that in crosswinds it lacks directional stability. This is especially noticeable at high speed on freeways, where its behaviour can only be described as poor. Many cars that have low drag coefficients suffer from a lack of directional stability (and the big Lexus is extremely slippery), but that's no excuse! So the modification task was to try to improve stability in crosswinds, and this was to be achieved by increasing front downforce (or reducing front lift, if that proved to be occurring). A wind tunnel is normally used to measure changes in lift and downforce. Inside the tunnel, the car is placed on very sensitive electronic scales that measure the effective weight of the car at all four corners. If the wind tunnel is moving lots of air past the car and the front wheels then push down less heavily, front lift is occurring. If in the same conditions the wheels push down more heavily than normal, downforce is occurring. Of course, since there are springs in between the body (which is generating the aero forces) and the wheels and tyres (which are transmitting these forces to the road) you can also measure downforce/lift by measuring the ride height. If the ride height is lower, it's because the body is being pushed downwards. If the ride height is greater, it's because the body is being lifted by the airflow. You can even get an idea of the forces involved by seeing how much weight you need to add (or how much lift you need to apply) to get the body to move up or down by the same amount. So how come everyone doesn't measure what's aerodynamically happening to their cars by measuring ride height at speed? Two reasons. 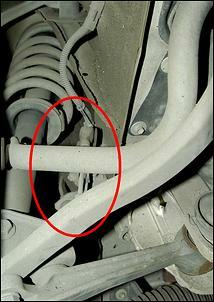 Firstly, you need to have a sensor mounted on the suspension. That can be as easy as a slide potentiometer or as complex as an LVDT. Use the slide pot and it's not hard to rig up a device yourself - although it's still a fiddly job. Secondly, as each bump is met, the ride height varies all over the place. Sorting out the average ride height can be quite hard to do when the ride height's always changing! However, in this case we were able to get excellent, repeatable results. 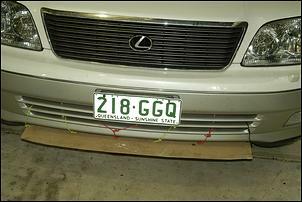 The Lexus has standard suspension height sensors front and rear - these are used as inputs into the automatic headlight levelling system. By unplugging the headlight levelling ECU and measuring the resistance across a pair of wires coming from the front sensor, the relative front ride heights could be read off as varying resistances. A Fluke 123 Scopemeter was used to log these readings - the Scopemeter has a very fast sampling rate and importantly in this application, calculates the average (and also records the highest and lowest readings) for the whole of the logged period. In addition, it shows on its TrendPlot graph the actual ride height pattern of the vehicle. This ride height measuring system worked brilliantly - the 'step' change in ride height when the driver sat in the car was clearly observable, and the difference in the recorded trace between freeway and back roads was obvious. 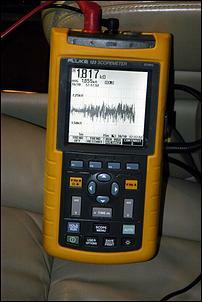 In this screen dump from the Scopemeter you can see the logged result of a 23-minute drive. The high trace movements are indicative of a high ride height (ie suspension droop) and the low trace movements show a low ride height (suspension bump). As you can see, early in the drive the road was fairly smooth - the car was on a freeway. However, the road then got much rougher. 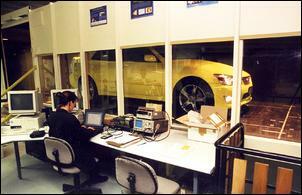 Aerodynamic testing at speed was carried out in the following way. 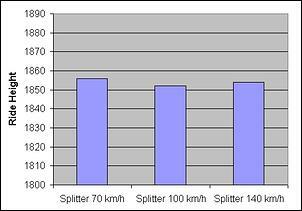 Firstly the car was accelerated to the required speed and then held at that speed. 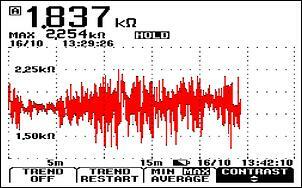 Once the speed had stabilised, the logging was activated. The car was then held at the speed for several kilometres and then prior to slowing at the end of the run, the logging was halted. The testing was carried out on a smooth, straight and nearly flat freeway. However, on-road testing soon showed that when it was deployed downwards, the aerodynamics headed in the wrong direction! This graph makes the difference clearer. It's obvious that with the spoiler in place, the front ride height is greater. 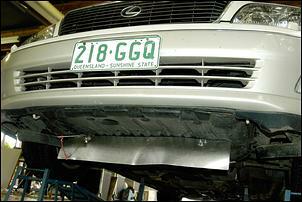 In fact, at 100 km/h the front is being lifted by up to 7mm. Again that doesn't sound much - until you try to lift the car by the same distance and see how much effort it takes! It's likely that with the spoiler positioned back from the front of the car, aerodynamic pressure was being brought to bear on the forward part of the front undertray, creating lift. 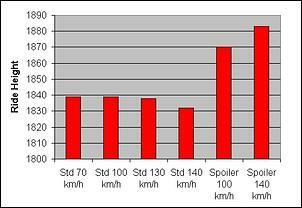 In this case the reduction of airflow under the car was more than offset by the build-up of pressure under the car, forward of the spoiler. So this approach certainly didn't work. I then tried a splitter - a flat piece of material projecting forwards from the lowest point of the frontal bodywork. This has the potential to capture air trying to flow under the car from the stagnation point (the point at which flow separates to flow over and under the body) and so create some downforce. Rather than use aluminium, the trial splitter was made from thin particle board. The next decision was whether to have it projecting across the full width of the lower bumper/spoiler, or just across the middle part. The problem was that the factory rubber edging located at each front corner was already a bit damaged (by being scraped on the ground, mostly coming into my driveway) and so if the splitter worked, these bits would need to be renewed or revised. But removing these rubber extension pieces and then placing the splitter right across the car would involve changing two factors simultaneously - so the 'centre-only' splitter was trialled first. It seemed likely that if a small splitter worked, a larger one would work better. Testing was done a little differently - because it was a new day and the baseline ride height may have changed a little, multiple tests were done at three speeds, each with the splitter in place. Even if it worked really well, at low speeds the splitter wouldn't be developing any downforce, so the 70 km/h figure was used as the baseline. This is a real world story - and the result isn't positive. Without reducing front ground clearance, I now can't see any way of improving front downforce. Perhaps a very fancy active front spoiler that folds itself up flat against the undertray and then concertinas down at the leading edge might do it - but how would you make one of those? Measuring average ride height is an excellent way of assessing lift and downforce variations, especially on cars that have relative soft springing. But the trouble with good testing of this sort is that it can show when mods aren't working - which is always a bit of a downer!